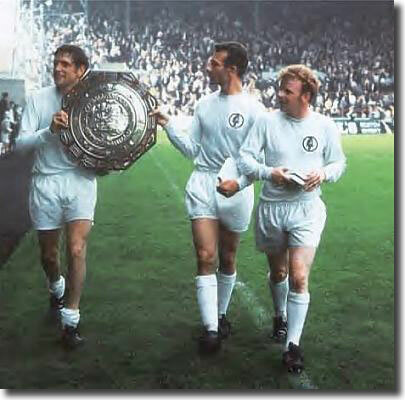 As 1969's League champions, Leeds United had an early opportunity to acquire more silverware the following season with an appearance in the traditional curtain raiser, the contest for the FA Charity Shield against FA Cup holders Manchester City. True enough, the Charity Shield was not the most highly regarded trophy in the world, but, after almost 50 years of footballing mediocrity, during which United could boast only a solitary Second Division championship, the club would not turn its nose up at any honour. 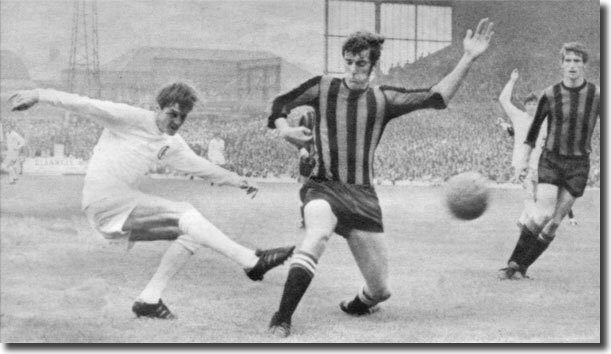 The match was staged at Elland Road, giving United's fans an early opportunity to assess the worth of their summer acquisition, Allan Clarke. The striker had arrived in a British record transfer deal after manager Don Revie agreed to pay Leicester City £165,000. It was the second time that Clarke had been involved in a record breaking move; the previous summer Leicester had paid Fulham £150,000 for his signature. He carried a glowing reputation as a goalscorer and had enhanced his status on England's summer tour of South America. Revie saw him as the man to provide a cutting edge in front of goal. United were renowned for being hard to beat, but they needed someone to put the icing on the cake with a regular flow of goals. Clarke was overjoyed at the move, saying, "I've always been a bad loser and I've craved to be part of a successful set up ... I'm looking forward to being with Leeds, and I know there's a lot of hard work ahead. What I admire about them is that they help one another and graft hard all the time. If I can't make it with them, I can't do it with anybody." Don Revie was typically reserved about the deal, claiming only that Clarke would strengthen his squad: "There's always the danger of injuries and then players could go off form, which means changes would be necessary." With England winger Mike O'Grady unavailable through injury, Clarke lined up in a twin spearhead with the hard working Mick Jones. Revie selected a 4-4-2 formation with Bremner, Madeley, Giles and Gray operating across midfield. The regular defence of Sprake, Reaney, Charlton, Hunter and Cooper were all on duty; Peter Lorimer was named as substitute. United's opponents, Manchester City, were an attractive and well regarded team under manager Joe Mercer and his assistant, Malcolm Allison. After winning promotion in 1966, they had won the championship in 1968 and secured the FA Cup at the end of April by beating a Leicester side in which Clarke had been man of the match. Rated as one of the best sides in the country, their outstanding forward line included England internationals Colin Bell, Mike Summerbee and Francis Lee. There was huge interest in seeing how Clarke would fit into United's system and a crowd touching 40,000 was on hand to get some early clues. 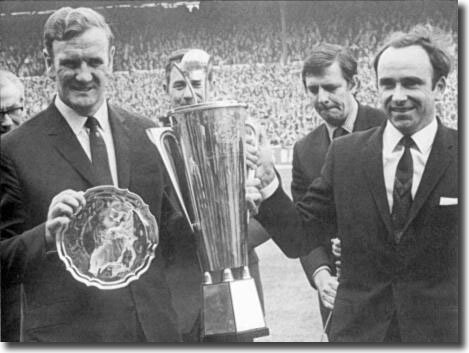 Before the kick off, a presentation was held in the centre circle, with Don Revie receiving the Manager of the Year trophy from representatives of Bell's Scotch Whisky. The Leeds fans roared their appreciation for the man who had transformed their club's fortunes. Clarke quickly made it clear how much of a new dimension he would bring to United's game. Phil Brown wrote in the Yorkshire Evening Post: "He had given better finish, the one quality United lacked last season and he had also sharpened the approach play. This against the especial marking that he must expect and against a defence which yielded only one goal in winning its six rounds of the FA Cup last season. "He had been near goals with a blazing shot and a header by half time, and he hit the bar in the second half, but for me the most important work he did was first in taking the weight off Jones and secondly in the smooth and intelligent way he slotted into the side's style. He is not, and I doubt whether he ever will be, a flamboyant type of player, but in his cool and laconic way he should markedly increase the cutting edge of United's attack." Tom German wrote prophetically in the Times of the way that Clarke and Jones gelled and complemented each other's talents, noting theirs as "a partnership to watch for." He added, "Leeds, having spent lavishly to enrich their attacking strength with Allan Clarke, now seem to have entrenched themselves even more firmly among the princes of English and European football. "Not unnaturally, the principal focus lingered on Clarke in this pre-season aperitif between League champions and FA Cup winners. There were no complaints, even though it was not quite the fairy tale first appearance in the best manner of a boys' periodical. Clarke did not score, but he came close to it on three occasions and deployed himself in a way which satisfied the Leeds manager, Don Revie. "Clarke struck the bar and stretched Corrigan to two fine saves with lightning recognition of the half chance. But there was more to Clarke than that to justify Leeds's expenditure. So often one has seen Jones carrying the weight of their thrusts: now there was someone ranged alongside, diverting attention, lightening his load. Jones responded like a bird freed from captivity. He left young Booth a yard behind in almost every chase, and with steadier aim could have scored twice before withdrawing with a strained back at half time." United roared straight onto the attack at the start of the game; Bremner dispossessed City after they kicked off and "volleyed upfield for Jones to hare into City's box in the right corner and link with Clarke. He dummied beautifully and made space for Giles to dip into the move and crack in a shot. It hit the post with Corrigan well beaten" (Yorkshire Evening Post). The Manchester men got a foothold in the action thereafter, but United were the team who consistently caught the eye. They allied an eagerness to break forward with the customary solidity at the back and Jack Charlton was a tower of strength after something of an edgy opening. The game reached the break without a score, but Leeds had been the more dangerous with Clarke threatening a goal on a couple of occasions. Their greater numbers earned them control of midfield and they exploited their possession adroitly, manufacturing a number of opportunities. They should have been ahead but were confident they would wear City down in the second half. Mick Jones had felt a twinge in his back and Don Revie sent Peter Lorimer out in his stead after the interval, unwilling to take any risk with more important challenges ahead. On resumption, City enjoyed an early opportunity; Lee beat both Charlton and Reaney before the big centre-half recovered to dispossess him. It was the newly capped England striker who was presenting United with the greatest danger, while the Guardian noted that "Summerbee might as well have stayed at home". United broke swiftly back only to be denied a second time by the frame of the goal - Clarke picked up the ball to shoot first time, but against the crossbar. They were not to be denied for long, however, and in the 54th minute took a deserved lead. Clarke fed Giles on the left and his long ball into City's box was perfect for Bremner. The Scot nodded it across the six-yard box for the unmarked Eddie Gray to flick past goalkeeper Joe Corrigan. United moved further ahead within three minutes after being awarded a free kick on the left flank after Lorimer was fouled by Tommy Booth. Giles floated the ball across City's box and Charlton was perfectly placed to nod home from nine yards. It was a trademark goal for the centre-half, and City should really have been more aware of a standard Leeds ploy; they could have done more to deny him the time to pick his spot. The goal knocked the stuffing out of Joe Mercer's men and it seemed that they had accepted the inevitability of a United victory. But the mercurial Lee never stopped trying and almost got the ball into the net during a goalmouth melee before flattening Sprake in an aerial challenge. City did manage some consolation. In the final minute Sprake misjudged a corner kick and Bell shot home, but it was far too late to spark a revival and seconds later the game ended with United 2-1 victors. It had been an efficient, if somewhat dull, victory, as Eric Todd reported in the Guardian: "Sufficient evidence was forthcoming in support of the belief that City again will be one of the most attractive and entertaining sides in the business, and Leeds again one of the most professional and most difficult to overcome ... Bremner once more stood revealed as an outstanding captain and an irrepressible player. He still is naughty on occasions, although when he perpetrates a foul, he now accepts reprisals as an automatic consequence, and does not retaliate any more. Which might appear to be a roundabout way of proving one's reformation. No matter. None of us is perfect. Madeley is well on the way to being very close to it. If he can be assured of more regular selection, this most versatile and accomplished performer will help raise Leeds to new heights." United president, the Earl of Harewood, presented Billy Bremner and his men with the shield and winners' trophies before they embarked on a customary lap of honour. It was a more than satisfactory start to one of the most memorable seasons in the club's extraordinary history.